Naples, Florida – NCH Safe and Healthy Children’s Coalition of Collier County has partnered with the City of Naples to launch the “Kids Don’t Float! 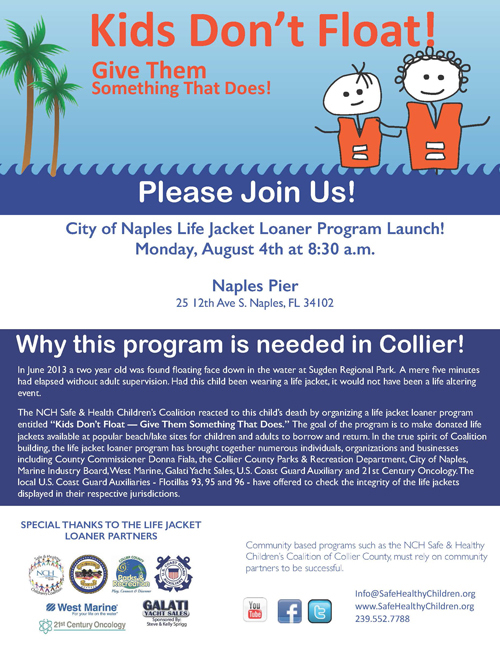 Life Jackets Do!” life jacket loaner program on August 4 at 8:30 am at the Naples Pier, 25 12th Ave S., Naples. Modeled after the “Kids Don’t Float – Give Them Something That Does,” initiative adopted in Alaska in 1997, the program will place loaner life jackets at three area beaches in the City’s limits, including the historic Naples Pier, the Naples Beach Hotel & Golf Club (851 Gulf Shore Blvd. North, Naples) and Lowdermilk Park (1301 Gulf Shore Blvd. North, Naples). There will be 20 life jackets at each area beaches with four adult sizes, four sizes 10-18 years, five sizes 5-10 years, and seven sizes for children five and under. The U.S. Coast Guard Auxiliary Flotilla 93 will conduct a monthly inspection on the condition of the life jackets for needed repairs or replacement. The mission of our Coalition is to achieve and sustain a zero drowning rate for children in Collier County. This ambitious and cooperative program will provide another layer of protection against drowning, the leading cause of death of children ages one-to four-years who reside in Collier County. The life jacket loaner program is already serving the following locations in Collier County: Sugden Park, Clam Pass, Vanderbilt Beach, South Marco Island, and Tigertail Beach. The Coalition’s goal is to expand the program to offer loaner life jackets throughout Collier County.